Building up to an amazing crossover, Kevin Wendell Crumb (James McAvoy) and his 24 personalities from “Split” returns to the screen alongside David Dunn (Bruce Willis) and mastermind Mr. Glass a.k.a. Elijah Price (Samuel L. Jackson) from “Unbreakable” to confuse the audience even more and end in disappointment. “Unbreakable” showed viewers David Dunn’s main special abilities of having super strength and the ability to sense if a person has done something wrong by simply touching them and getting a vision from that. He was the only survivor of a train crash that was set up by the literal evil genius Elijah Price, who goes by the name Mr. Glass. Although he has an incredible mind like none other, his body is extremely fragile in the way that if he is even patted on the shoulder, his bones will break. Then in “Split,” viewers kept looks of confusion and shock throughout the two-hour movie as they watched 24 personalities take over the mind of Kevin Wendell Crumb. They led him to kidnap “impure,” young girls who haven’t been through real pain and feed them to his 24th personality, The Beast. More specifically, The Horde, consisting of Dennis, Patricia, and Hedwig, a nine-year-old boy, try to block off the other personalities in order to follow along with their plan of letting The Beast take over. In the end, The Beast lets one out of the three kidnapped girls go after seeing that Casey Cook has indeed suffered and also has a tragic childhood. 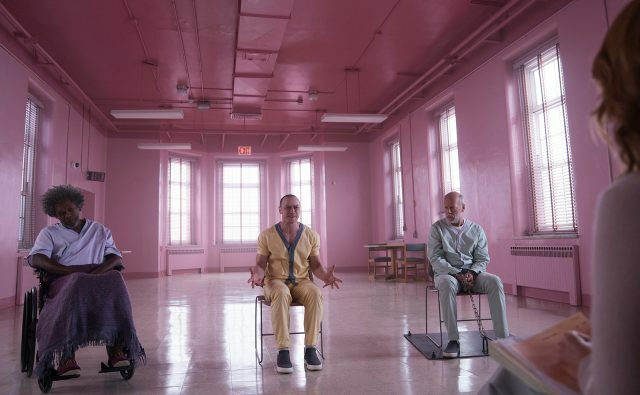 Director M. Night Shyamalan, combined the two movies into “Glass,” with all three of the main characters eventually ending up at Raven Hill Memorial Psychiatric Research Hospital. They are all in a program led by Dr. Ellie Staple (Sarah Paulson) in which she tries persuading them into believing that whatever it is that’s making them have the powers of a superhero or villain can be ordinarily explained and that the powers are only in their minds. Meanwhile, it seems Dr. Staple and Mr. Glass both have two different plans brewing in their minds that makes the story interesting. Unfortunately for the audience, the climax of the movie comes in around the time the falling action is also taking place. The main storyline itself is definitely an interesting concept and the movie started out captivating. However, once it gets farther and farther into the movie and viewers see how much the information is building up and that the movie itself is almost over, the audience knows it’s either going to be a killer ending or a rushed one. In this case, it was too rushed and it seems like the characters all could have had more movies made in which it goes into detail about how they come to terms with their powers while defying against the “Clover” group who doesn’t want the world to know about these extraordinary beings. There could have been an origin story for that group since they were randomly thrown in at the end and only briefly discussed. It could explain why they have such a hatred for beings with obvious powers and exactly who Dr. Staple is, including why she’s a part of that group. There could be another one in which Kevin either stays in the light on his own or if he finds a way to control all of his personalities, including The Beast. There could also have been more background into how Mr. Glass somehow knew that Kevin would turn into some kind of beast if his multiple personality disorder didn’t get treated. The movie left so many unanswered questions and so many possibilities for something better to have happened. With the way everything crumbled in the end, it’s a shame that this was the ending chosen for the trilogy. While Mr. Glass’s mother, Casey, and David’s son come together to release footage proving that there are people with superhuman abilities, what’s supposed to come after that? If the idea was to let the viewer simply believe that the world sees the videos and starts believing in these people and that’s all, that was achieved. However, there aren’t any more known superhumans which means the world would just be on edge, looking for these people. Again, so many unanswered questions. Mr. Shyamalan: If you’re going to create a superhero universe, don’t rush the origin stories, don’t cram random information that was never even hinted at into the last 10 minutes and actually build-up to the “big” showdown instead of belittling it and killing key characters. Marvel barely got away with offing 50 percent of their main characters and it was only because it was expected, plus there were 18 movies building up to their rather substantial showdown. Take notes.